It’s always good to keep some cheapy wine on hand, and by cheapy I mean wine that tastes good but is under $10 per bottle–or whatever priced wine with which you could justify cooking. Try and keep at least one red and one white on hand. I suggest keeping it in the same cabinet as your cooking sherry, that way you don’t accidentally pull it out to drink one night because then you won’t have any for cooking with the next time you need it! This recipe is a lovely substitute for the über traditional corned beef and cabbage, and is likely to be liked better by a crowd (so long as they can do red wine!). 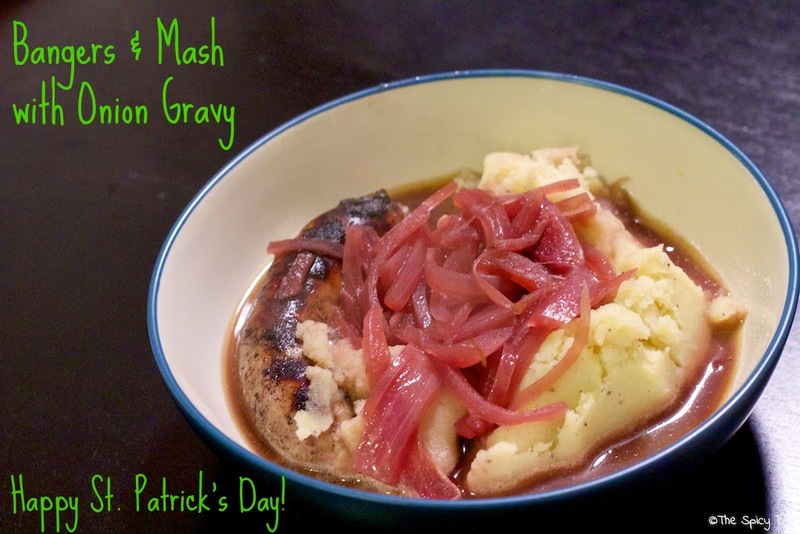 Don’t let the onion gravy turn you off–it’s more of just a red wine reduction that is thickened with the cornstarch–which, honestly, is optional in my opinion (Ktams likes his gravy thicker so he experimented with the thickener and found a nice sweet spot). In other news, this weekend is the weekend of the Shamrock! Yikes!! Cross your fingers and your toes for me that I finish as well as I did last year! While I was feeling stronger than I had been last year, it was all thrown to the wayside when we started closing on the house, and at this point I will just be happy to finish around where I was last year (1hr 35min). Start with the potatoes. Boil fully submerged in water until they easily slide off a fork. 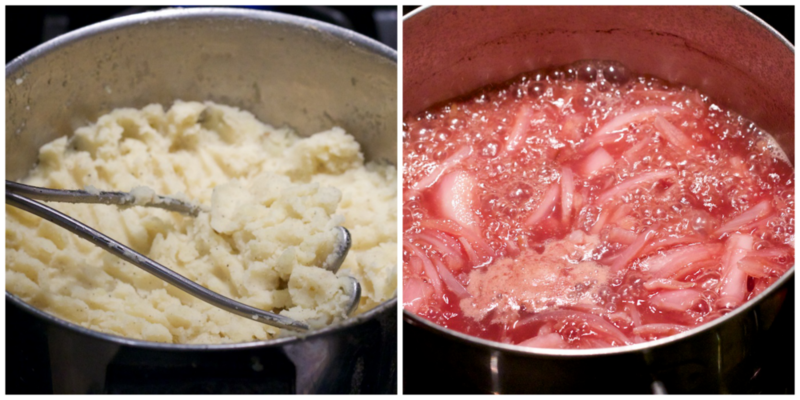 Drain and mash, adding butter, salt, and pepper. Grill the Bangers, approximately 5 minutes per side. Melt 4 T butter in a saucepan and add onion, cooking until translucent. Add broth and wine and bring to a rapid boil until reduced by half. Mix cornstarch with cold water and add slowly to the gravy while it finishes up the boil. Serve with a healthy helping of gravy (because it’s delicious!) making sure to include the onions. The recipe takes just under an hour from start to finish, and makes dinner for approximately 4.